It’s easy to make a difference for your neighbors and community by volunteering with Goodwill SCWI! Whether you’re fulfilling educational or community service hours, working to expand your employability skills, a group seeking a service activity or an individual simply looking for a great way to give back with your time and energies, Goodwill is happy to have you on our team. Typical volunteer activities include retail store operations, general office work or grounds/facilities projects. Goodwill SCWI has numerous locations, so we can be pretty flexible on the “where and when,” depending on location needs. Getting started is easy — simply complete and submit the interest form below to help us understand what you’re looking for, and then the Goodwill SCWI team will be in touch. Thank you for thinking of Goodwill SCWI! We look forward to working with you soon. Please feel free provide us with any additional information or questions. Thank you Exact Sciences for generously volunteering your time and hard work for Goodwill! 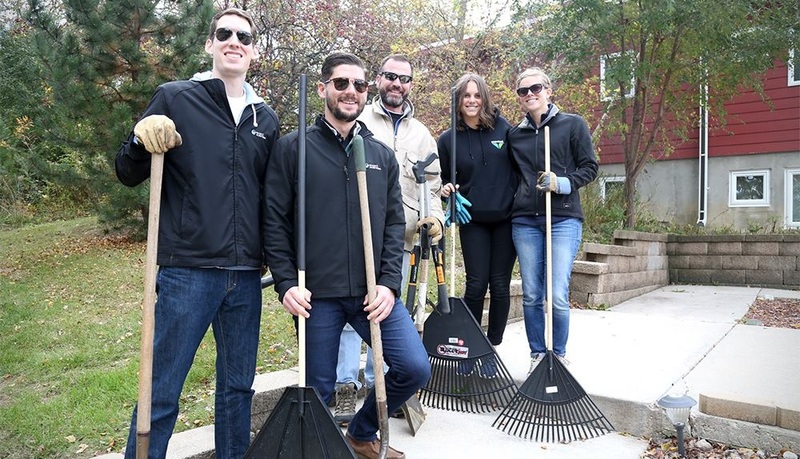 Exact Sciences staff helped to beautify the grounds at one of our supportive apartment buildings. We own eight apartment buildings that provide permanent and affordable housing to low-income workers and others with chronic mental illness, as well as low-income retirees.